3/4" (18mm) Antique Brass Magnetic Purse Snap / Closure. Our Newest style of snap. This style is commonly found on Coach handbags. 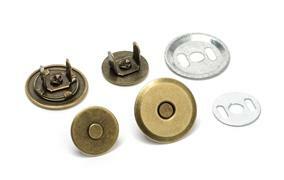 Each snap comes with one male (14mm), one female (18mm) snap end, and two washers.